Menulog delivers for Samosorn Thai so you'll be able to track your courier on a map. Stir-fried wide rice noodles with chicken, hens egg and Chinese kale in dark soy sauce. Stir-fried wide rice noodles with chicken, chilli and holy basil in dark soy sauce. Egg noodles with chicken, dark soy sauce, chilli and holy basil. 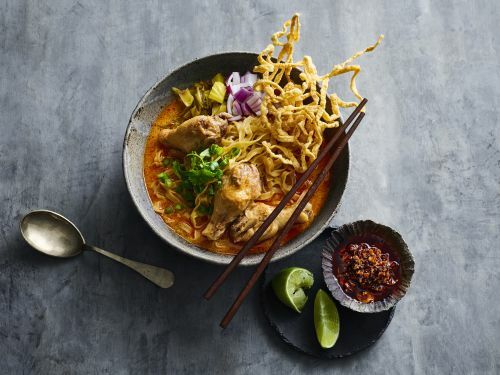 Egg noodles with chicken, spicy and sour curry paste. Stir-fried rice vermicelli noodles with pork, egg and choy sum. Thin rice noodles with chicken, dried shrimps, bean sprouts, garlic chives, egg and peanuts in tamarind sauce, fish sauce and palm sugar. Contains peanuts and eggs. Stir-fried vegetables with oyster sauce and rice. Fried rice with chicken, eggs, Chinese kale, onion and shallot lightly seasoned with soy sauce. Stir-fried water spinach, garlic and chilli with yellow bean sauce and rice. Stir-fried crisp pork belly and Chinese kale with rice. Glass noodles, braised chicken, eggs and water spinach in a spicy fermented bean curd sukiyaki sauce. Contains sesame seeds and oil. Stir-fried wide rice noodles with pork, Chinese kale in soy sauce and yellow bean sauce. Thick rice noodles with chicken, cashew nuts and smoky chilli jam stir fries. Fried rice with salted mackerel, hens egg, chilli and red onions. Fried rice with fermented pork, egg, onion, Chinese kale and chilli. Fried rice with chicken, chilli and holy basil with fried egg. Stir-fried minced chicken, fresh chilli and holy basil with fried egg and rice. Stir-fried crisp pork belly, fresh chilli and holy basil with fried egg and rice. Stir-fried chicken, cashew nuts and smoked chllli jam with rice. Contains nuts. Stir-fried crisp pork belly and green beans in a spicy and sweet house made chilli paste with rice. Fried rice with crab meat, hens egg and shallots. Green curry of chicken with apple eggplants, kaffir lime leaves and Thai basil with rice. Massaman curry of slowly braised beef shin and potato. Includes peanuts. Panang curry of chicken with bamboo shoot, eggplants and kaffir lime leaves with rice. Stir-fried egg noodles prawns, choi sum, wombok and chilli. Fried rice with pineapples, sultanas, egg, prawns and cashew nuts. Tom yum fried rice with prawns, soft boiled hens egg and herbals. Stir-fried roasted duck, fresh chilli and holy basil with fried egg and rice. and tamarind relish with rice. Chargrilled pork ribs, smoked chilli and tamarind relish with rice. with chicken broth on the side. Caramelised smoked pork hock in five spice reduction with Chinese kale and pickled mustard greens and rice. Crisp pork belly, BBQ pork, boiled egg and gravy with rice. Roasted duck with pickled ginger, greens and duck gravy with rice. Spicy thin rice noodles with fish dumplings, BBQ pork and minced chicken. Soup or dry. Includes peanuts and dried shrimps. Thin rice noodles with pork or beef and Chinese kale in thick spicy broth. Egg noodles and braised chicken in a turmeric base Northern Region coconut curry with smoked chilli oil. Rice vermicelli noodles with shredded chicken in clear broth. Thin rice noodles with braised pork in five spice broth. Thin rice noodles with braised beef in five spice broth. Fresh rice noodles with pork ribs in a clear pork broth. Thin rice vermicelli noodles with minced chicken with spicy and sour larb flavor. Egg noodles with duck in five spice broth. Soup or dry. Thin rice noodles with king prawns and calamari in sour and spicy tom yum broth with boiled egg. Chicken satay skewers. Sauce contains peanuts. slightly sweet version. Contains peanuts. Sausage of pork with aromatic herbs and chilli. Chargrilled pork shoulder with smoked chilli and tamarind relish. Chargrilled pork ribs with smoked chilli and tamarind relish. Chargrilled beef tenderloin with smoked chilli and tamarind relish. Chargrilled beef salad with tomatoes, cucumber and fresh chilli. salted duck egg. Contains peanuts. broth of dill, lemon grass and chilli. Curry of pickled bamboo shoots and lemongrass. The sear broth and is mildly spicy. Spicy green mango salad with pickled crab, dried shrimps and fermented fish. Includes peanuts. Grilled pork neck with green papaya salad Thai style. fermented rice noodles and pickled cabbage-pickle fest. Green papaya salad with pickled crab and Thai pork sausage roll. Hot and sour soup of braised pork ribs. Fried chicken with fried garlic, kaffir lime leaf and chilli. Spicy salad of curried rice croquettes, fermented pork, ginger and peanuts. Spicy curry of seasonal mushrooms, pumpkin, luffa squash with a paste of lemongrass, red onions, chilli and lemon basil simmered with yanang leaves. Chargrilled marinated chicken with smoked chilli and tamarind relish. Tapioca coated water chestnuts in an aromatic syrup with fresh coconut milk and young coconut fresh with ice. An assortment of jellies, candied seeds and pandan noodles in an aromatic coconut syrup with shaved ice. Pandan and palm sugar noodles, black glutinous rice and taro in coconut milk with ice.